Is a visit to Yosemite National Park at the top of your travel bucket list? If so, you wouldn’t be alone. More than five million people visited Yosemite in 2016! Even campsites and lodges, which have to be booked months in advance, can have serious crowds. Yosemite lodging outside the park is one way to manage the masses. The park’s newest lodging in more than 25 years, Rush Creek Lodge, is a wonderful new option for families who want to escape the crowds. Here are a few more ways to avoid the crowds in Yosemite. North America’s tallest waterfall and the towering 3,000 foot El Capitan are breathtaking. Yet there are times when crowded trails make this national park feel more like an amusement park. One way to avoid the crowds at Yosemite is to spend the night in lodging outside the park. 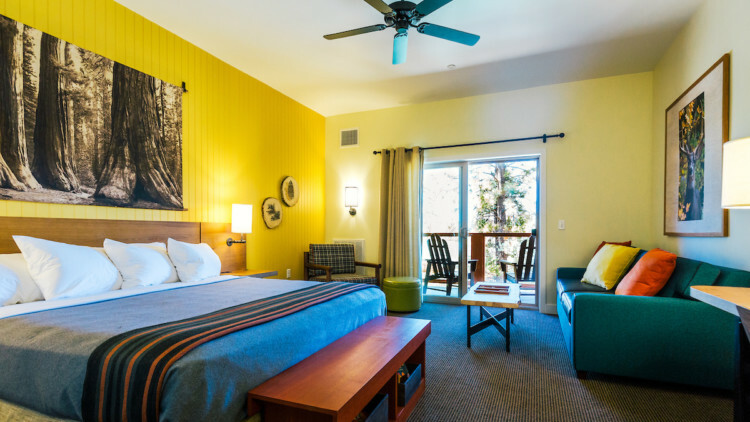 Opened in 2016, Rush Creek Lodge is just a 1/2 mile from Yosemite National Park’s Highway 120 west entrance. 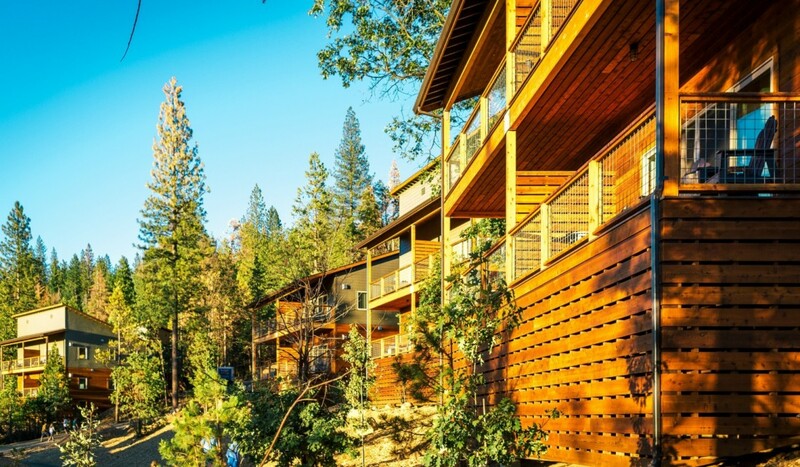 If you are looking to escape Yosemite’s crowds at a hotel with lots of kid-friendly activities, Rush Creek Lodge is a great option. Comfortable beds with high thread count sheets, clean modern bathrooms, and a large landscaped pool with cushy chaise lounges. It’s just what you need after a long day hiking. Families will also love the large family hot tub (adults only hot tub is available too) which are open year round. A fire pit overlooking the pool is a perfect spot to relax at the end of the day. It’s also where you’ll find the complimentary S’mores at night. There are live entertainment, summer barbecues and plenty of games like shuffleboard and bumper pool. We loved our two bedroom hillside villa with its microwave and mini-fridge. There are 143 rooms, each with a large balcony overlooking the surrounding forest. 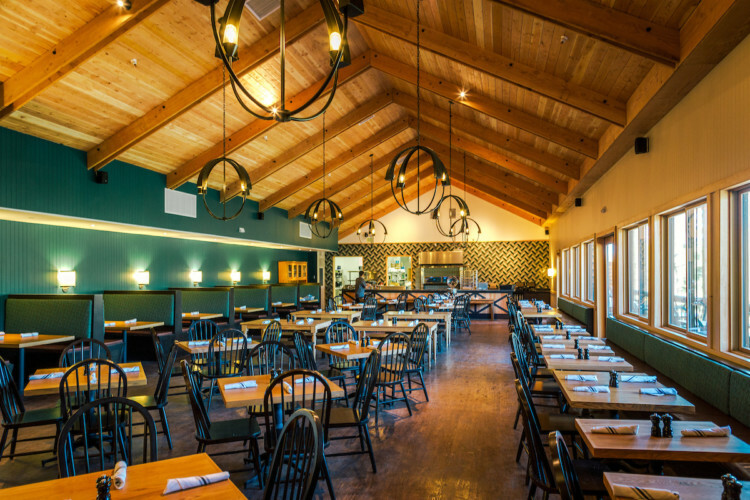 The grand main lodge features a restaurant and tavern as well as a cute general store. Here you can pick up everything from milk and cereal to ready-made sandwiches. Get your day started by ordering pastries and other grab-n-go items at the coffee shop. For a sit-down breakfast, the restaurant opens at 7 am, offering a wide menu, including omelets ($15) and breakfast burritos ($14). The restaurant is also open for lunch and dinner offering a kids’ menu. Throughout the summer, the lodge offers an outdoor barbecue set up by the pool with live music. And, weather permitting, treat your family to complimentary S’mores around the poolside firepit every night. It’s both a fun activity, as well as free bedtime snack or dessert! All around the 20-acre wooded property, you’ll find lots of fun surprises for kids and adults alike, including ping pong, hammocks and a daily list of activities during the summer. The fun game terrace features a variety of complimentary games, including shuffleboard and foosball. Kids will love the pool at Rush Creek Lodge, outside Yosemite National Park. photo credit: Kim Carroll, courtesy of Rush Creek Lodge. The large landscaped pool has two outdoor jacuzzis and a bar where you can buy snacks as well as alcoholic drinks. The only problem will arise when it’s time to pull the kids from the pool. You could easily spend your entire vacation having fun at the resort, but then you’d miss out on the main attraction: Yosemite National Park. Tip #1: Arrive early in the day. By 9:30 am, the parking lots in Yosemite Valley are already full. Make sure and arrive before 9 am, park your car for the day and ride the free visitor shuttle buses to avoid reparking. To enjoy a peaceful hike, hit the most popular trails early. 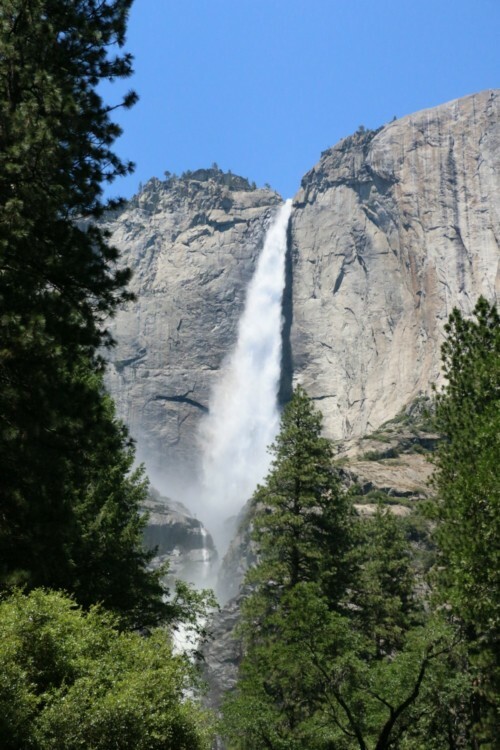 I recommend parking at Half Dome Village, walking to the kid-friendly nature center, then taking the Mist Trail up to Vernal Falls and Nevada Falls. Tip #2: Go off the beaten path. 90% of visitors never see anything beyond Yosemite Valley. To beat the crowds, take some of the roads, or trails, less traveled. The easy Valley Loop trail, starting from shuttle bus stop 6, is one good option. Merced Grove and Inspiration Point trails are two other good choices. Talk to park rangers for more suggestions. Tip #3: Visit in the off-season. To avoid warm-weather crowds, consider coming in spring, fall, even winter. Yosemite is a 3 1/2 hour drive from San Francisco and a 5 1/2 hour drive from Los Angeles.